Where do I even begin with this post? I guess I'll start by sharing that I officially hate my hospital and that I do NOT have gestational diabetes, thank goodness. My experiences with these tests (yes, multiple tests) were miserable. 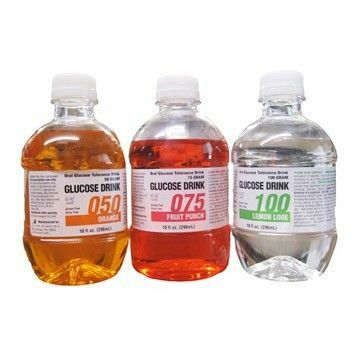 At 28 weeks pregnant, my doctors sent me to the lab in the base hospital to do the one hour glucose test. No biggie, right? Wrong. I called to get my results that afternoon, and I FAILED. By a lot. Like a lot a lot. Almost enough for them to diagnose me with gestational diabetes. I knew something wasn't right, though. I made sure to eat only protein before going in. My blood draw was in the morning, so I actually just didn't eat breakfast. There was NO WAY my blood glucose was as high as they said it was. Get this: not only did my asthma medication (albuterol - so I can breathe and so Baby Cookie can get her oxygen too!) made it high... and no one warned me about that... but ALSO, they gave me double the grams of the liquid for the one hour test. That'll do it. After fasting and then drinking this horrible liquid, I was fine for about an hour. I sat in the main waiting area, and I went back to have my blood drawn at the one hour mark. Did I mention it was the new workers' first day on the job? No? Well, it was. And they were so nervous. The lady who was drawing my blood was SHAKING as she moved the needle toward my vein. I have NOT had the best experiences with this hospital to begin with (like that time I was admitted for kidney stones, and it took them SEVEN times to get my vein for an IV - 90 whole minutes and two VERY bruised arms). I started feeling woozy just thinking about that, and she dug that needle into my arm and STARTED MOVING IT AROUND. What?! NO! I felt myself getting flushed, and I announced that I was dizzy and hot and was going to pass out. Luckily, I didn't pass out. But I almost did. Everyone in the room rushed over to me with water, and then they let me lay down in a bed for the other two hours I had left... and I got an experienced phlebotomist to do the remaining blood draws... thank goodness. After leaving, I had the best meal of my life. I couldn't even wait until I got home. I went through a fast food drive-thru and ate in my car. And when I say ate, I actually mean scarfed the food down as quickly as I could. And it was glorious. The best news? I passed the fasting blood draw and every single hour - including the first hour that I failed the first time around - with flying colors! In fact, my third hour blood draw was LOWER than it should have been... confirming my hangriness. I need food, people. I'm SO glad that part of pregnancy is over. Here's to four-ish more weeks! Good grief! Well I suppose on the bright side, that's great you don't have gestational diabetes! But I hate that you had to go through all that! Ugh!! So glad this part is over for you! So glad you made it through! Sounds horrible! My biggest fear in eventually being pregnant is having gestational diabetes. Oh man, I'm sorry you had to go through that. Ick. The glucose test is horrible. I failed my first one with Dannika too because I drank a Starbucks green tea frappucino on my way to my test...oops. and I agree with Kate (above me). Ditch the military hospital! Tricare standard is so worth it! Ughh how awful. It seems a lot of my pregnant buddies have been failing first.. Must be something about that first test. I wish you a great next few weeks. That three hour test is absolute torture. Seriously why do they do that to pregnant women! I did the same with a fast food meal in my car right afterwards. I also agree with going Tricare Standard! It was so worth it! Stupid glucose test! I have a whole rant about why it's a waste of time. But FTR, I had a great experience at our post hospital. The glucose test wasn't part of it :) but my delivery was awesome.